The 26th edition of world’s premier football league has already started. Whilst the clubs are still looking to find right players and combinations to challenge for the top honors here are so far the completed transfer lists of English Premier League as in on August 22. Sead Kolasinac: The German-born Bosnian full-back is adept at operating on the left flank. The Gunners wasted no time announcing the capture of 24-year-old on a free transfer from Schalke. Alexandre Lacazette: The French striker from Olympique Lyonnais (Lyon) cost Arsenal club-record deal of £46.44million. The 26-year-old scored 28 goals in 28 starts for Lyon last season in Ligue 1. Asmir Begovic: The Bosnian goal-keeper switched from Chelsea to Bournemouth seeking a first team starts. The Cherries target to stay on the top half of the table as a deal worth £10 million was agreed. Jermaine Defoe: Age is just a number for England striker Jermaine Defoe. Sunderland’s relegation in his last year of contract prompted the 35-year-old to move on a free. Defoe’s return to Bournemouth, where he scored 19 goals on loan in 2000 brings an underrated career full circle. Nathan Ake: Bournemouth signed another Chelsea player, this time a Dutch defender for a club record fee, reported to be in the region of £20million. The 22-year-old international spent the first half of last season on loan with the Cherries. Conor Mahoney: Bournemouth announced the signing of winger Connor Mahoney after his Blackburn contract expired. Mahoney, a 20-year-old former England youth international, has signed a four-year deal. Pascal Gross: Brighton began their preparations for a first-ever season in the Premier League by signing Pascal Gross from Bundesliga club Ingolstadt for a fee of £2.55 million. Midfielder Gross, who joined Ingolstadt in 2012, has agreed to a four-year deal. Josh Kerr: The 19-year-old defender linked up with the Premier League newcomers on a two-year deal after Scottish club Celtic agreed on an undisclosed fee. Mathew Ryan: Brighton agreed on the signing of Australia goalkeeper from Valencia. The newly-promoted Seagulls captured the 25-year-old on a club record fee of £5 million on a five-year contract. Markus Suttner: Brighton announced the signing of Austria left-back from Ingolstadt. The 30-year-old has signed a three-year deal with the Seagulls having moved from the German second-tier side for a fee of £3.8 million. Mathias Normann: Brighton made their fifth summer signing, bringing in midfielder for an undisclosed fee from Norwegian second division side FK Bodo/Glimt. The 21-year-old agreed on a three-year contract with the Premier League newcomers. Izzy Brown: Brighton signed the striker from Chelsea on a season-long loan deal. The 20-year-old helped Huddersfield to promotion via the play-offs while on loan last season. Davy Propper: Brighton broke their club transfer record to sign the Holland midfielder, 25, on a four-year contract. Former PSV Eindhoven midfielder cost a fee of £10 million. Jose Izquierdo: Brighton completed the club-record signing of Colombia international winger from Club Brugge. The 25-year-old has signed a four-year deal for an undisclosed fee believed to be around £13.5million. Charlie Taylor: Burnley confirmed the signing of English defender from Leeds for a compensation fee yet to be agreed on. The out of contract 23-year-old put pen to paper on a four-year contract at Turf Moor. Jon Walters: The 33-year-old Republic of Ireland international left Stoke following seven years of service after being offered a longer contract at newly promoted Burnley side. The Clarets captured the midfielder for a fee of £3 million. Jack Cork: Burnley announced the signing of the midfielder for £10 million on a four-year-deal from Swansea. The 28-year-old returns to Turf Moor having made 57 appearances for the club during a loan spell from Chelsea between January 2010 and May 2011. Phil Bardsley: Burnley has completed the £1.5million capture of the defender from Stoke. Stoke will receive an initial £750,000 and the fee rising to £1.5m should certain performance-related add-ons be triggered. Chris Wood: Burnley signed striker from Leeds for a club-record fee of £15m that could rise to £18m.The New Zealand striker finished as the Championship’s leading scorer with 27 goals last season. Willy Caballero: The 35-year-old Argentinean was available as a free agent after being released by Manchester City at the end of last season. Premier League champions Chelsea snapped up the veteran goalkeeper after selling Asmir Begovic to Bournemouth. Ethan Ampadu: Chelsea reached a deal to sign the Exeter City U-19 Wales defender Ethan Ampadu. The Premier League champions are in negotiations over agreeing on compensation with the League Two club for the highly-rated 16-year-old. Antonio Rudiger: Chelsea made their first major signing of the summer with the arrival of Roma defender on a five-year contract. The 24-year-old Germany international will cost the Stamford Bridge club an initial £29million with add-ons potentially taking the deal to £33.3 million. Tiemoue Bakayoko: Chelsea announced the signing of French midfielder from Monaco. The 22-year-old, who played a leading role in Monaco’s run to the Champions League semi-finals last season, signed a five-year contract at Stamford Bridge. The France international has reportedly cost the Blues around £40 million. Alvaro Morata: The Spain striker, linked with a move to Manchester United earlier in the transfer window, signed a five-year deal with the Premier League champions on a move believed to be worth around £60million. Ruben Loftus-Cheek: The 21-year old Jamaican born English midfielder has joined Crystal Palace on a season-long loan deal from Chelsea. The midfielder becomes new Eagles manager Frank de Boer’s first signing at Selhurst Park after completing the move. Jairo Riedewald: The 20-year-old defender will be reunited with Eagles boss Frank de Boer who gave him his first-team debut at Ajax in 2013. Defender Riedewald has won three caps for Holland. Timothy Fosu-Mensah: Crystal Palace has announced the season-long loan signing of Manchester United’s Holland Under-21 international defender. The 19-year-old will link up with new Eagles boss and compatriot Frank de Boer ahead of the new Premier League season. Jordan Pickford: Everton signed England Under-21 goalkeeper in a club-record deal. Pickford joins from Sunderland on a five-year contract for a £25 million fee that could rise to £30 million. Pickford displaced Jordon Ibe as the most expensive uncapped English footballer. Davy Klaassen: Everton announced the signing of 24-year-old midfielder from Ajax. Everton confirmed a £23.5 million deal for Dutch international and Ajax skipper Klaassen. Henry Onyekuru: The Toffees beat Arsenal to the signing of the Nigerian striker Onyekuru. The 20-year-old will join for £6.8 million from Eupen but will be loaned to fellow Belgian club Anderlecht. Sandro Ramirez: Everton completed the signing of Spanish striker on a four-year contract. The 21-year-old was linked with a move from Malaga since the end of last season. Everton agreed to pay his £5 million release clause. Michael Keane: Everton signed the English defender from Burnley in a deal that could reach up to £30 million. The 24-year-old signed a five-year contract at Goodison Park. Anton Donkor: German-side Wolfsburg forward has rejoined Everton on loan after his previous spell last season was disrupted by injury. The 19-year-old German agreed on an initial deal until January 2, 2018. Josh Bowler: The 18-year-old hot prospect completed his £4.25m move from QPR to Everton. The young midfielder signed a three-year contract at Goodison Park. Wayne Rooney: All time top goal scorer of Manchester United sealed his move for free to Everton after 13 years at Old Trafford. The 31-year-old has rejoined his boyhood club ending a career at United that saw the £30 million teenager, signed by Sir Alex Ferguson in 2004, making 559 appearances and scoring 253 goals. Cuco Martina: Everton made the umpteenth signing of the summer after landing the defender on a free transfer following Southampton release. The 27-year-old full-back has signed a three-year deal following his release at the end of last season. Lewis Gibson: The England youth defender, who recently turned 17, has agreed on a three-year contract at Goodison Park. Everton secured the Newcastle and England wonderkid in potential £6 million deal. Gylfi Sigurdsson: Everton completed the club-record signing of around £45million. 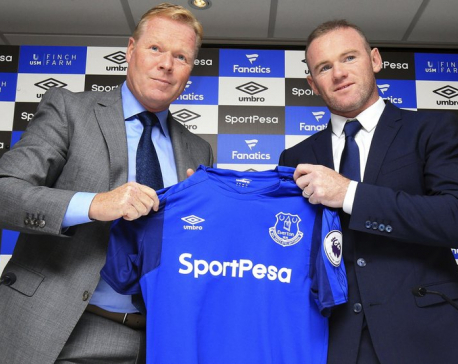 The 27-year-old Iceland midfielder has put pen to paper on a five-year contract and becomes the Toffees’ eighth summer arrival. Elias Kachunga: Huddersfield Town signed already on-loan striker from German Bundesliga side Ingolstadt for £1.1 million. The newly promoted premier league club triggered the clause to sign the 24-year-old DR Congo player on a contract until 2020. Laurent Depoitre: Huddersfield announced the signing of Belgium striker from Porto for, at the time club-record fee, £3.5 million. Terriers made their first signing since clinching promotion to the Premier League as the Kachunga deal was confirmed before they were promoted. Aaron Mooy: Huddersfield broke their club-record fee in a matter of days with the signing of Aaron Mooy from Manchester City for £10 million. Australian international Mooy penned a contract until 2020. Jonas Lossl: Huddersfield Town completed the signing of Danish international goalkeeper on a season-long loan from Bundesliga club 1. FSV Mainz 05. The 28-year-old joins the Terriers on loan until 30 June 2018, at which point Huddersfield Town has the option to complete a permanent transfer. Tom Ince: Huddersfield signed 25-year-old winger Tom Ince from Derby for a fee of £8.5 million. Former England Under-21 international Ince has agreed a three-year deal with the newly-promoted Premier League club having the option of a further 12 months. Kasey Palmer: Attacking midfielder Palmer returned on a season-long loan from Chelsea. The England U21 international returned to Huddersfield on a season-long loan until June 30, 2018. The 20-year-old makes the move back from Chelsea having also spent last campaign at the John Smith’s Stadium. Danny Williams: The United States international headed to the newly-promoted club after his contract with Reading ran out this summer. Huddersfield announced the addition of 28-year-old defensive midfielder on a two-year deal for free. Steve Mounie: Huddersfield broke their club-record fee thrice this summer when they signed Montpellier forward for a fee of £11.5 million. The 22-year-old Benin international has dual French nationality and scored 14 goals in Ligue 1 last season. Scott Malone: The 26-year-old English full back enjoyed a successful season with Fulham being named in both the EFL and PFA’s Championship teams of the year. The left-back arrived on a three-year deal for the fee of £5 million. Mathias Jorgensen: Huddersfield signed Denmark international on a three-year deal. The Premier League newcomers agreed on a fee of £3.5 million with FC Copenhagen for the 27-year-old centre-half, who is a five-time winner of the Danish Superliga and has 11 caps for his country. Harry Maguire: Leicester signed English defender from Hull for £17 million. The 24-year-old joined the Foxes on a five-year deal following the Hull’s relegation from the Premier League. Vincent Iborra: Leicester completed the signing from Sevilla on a four-year deal. The midfielder joins for an undisclosed fee, reportedly around £12 million, to become the Foxes’ second major signing of the summer after Macguire. Eldin Jakupovic: Leicester signed Hull keeper for £2.5million on a three-year deal. Foxes have been on a search for an experienced backup to Kasper Schmeichel since Ron-Robert Zieler joined Stuttgart. George Thomas: Leicester City signed the forward from Coventry City on a three-year deal for an undisclosed fee. Dominic Solanke: Liverpool won the race to sign Chelsea youth team striker Dom Solanke. The 19-year-old opted to join Jurgen Klopp at Anfield after he ran out of his contract for Premier League Champions. A compensation fee for Solanke is yet to be decided. Mohammad Salah: The Egypt international signed a five-year contract for a fee of £34.3million, including add-ons. If activated, 25-year-old former Roma winger will be club-record transfer increasing the fee to £39 million. Andy Robertson: Liverpool agreed on a £10million deal with Hull City left-back. The 23-year-old is Reds' third signing of the summer. Bernardo Silva: Manchester City announced the signing of Monaco playmaker. It is understood City paid £43million for the 22-year-old Portuguese midfielder. Ederson: Manchester City completed the signing of Brazilian goalkeeper for the fee of £34.7million. The 23-year-old joins the Citizens from Benfica on a five-year contract. The fee for Ederson is a record paid by a British club for a goalkeeper, beating the previous record of £18.9million paid by Manchester United for David De Gea six years ago. Kyle Walker: Manchester City reached an agreement to sign Tottenham Hotspur right-back Kyle Walker for £50 million which makes him the most expensive defender of all time. Walker left Spurs after eight years and more than 200 appearances for the club, and he also earned 27 England caps during that time. Douglas Luiz: Manchester City announced the signing of Brazilian midfielder from Vasco da Gama on a five-year contract. The 19-year-old is reported to have cost £10 million and is expected to head out on loan to City's sister club Girona in Spain. Danilo: Manchester City completed the signing of full-back Danilo from Real Madrid on a five-year deal. The 26-year-old will join up with his new team-mates after agreeing on the personal terms and a fee around £26.5 million. Benjamin Mendy: The AS Monaco left-back's arrival in a reported £49.4million deal takes Pep Guardiola’s summer spending past £200m, with defensive acquisitions alone totaling £156million as Mendy joins Real Madrid’s Danilo and Tottenham’s Kyle Walker as back-four recruits, in addition to new goalkeeper Ederson, bought from Benfica. Larry Kayode: Manchester City signed Nigerian striker from Austria Vienna and immediately loaned him out to Girona. Victor Lindelof: Manchester United made the Swedish defender their first signing of the summer for a four-year deal. United paid Benfica £35 million (£30.75 million) for Lindelof, although the Portuguese club announced that the fee could increase by a further £10 million due to add-ons. Romelu Lukaku: Manchester United completed the signing of Belgian striker from Everton on a five-contract after they agreed on a fee of reportedly an initial £75million. The 24-year-old international player scored 25 Premier League goals last season. Nemanja Matic: Jose Mourinho welcomed the Serbian defensive midfielder to Manchester United with some high praise. The most expensive Serbian player ever joined United for a fee of £40m from Chelsea. Christian Atsu: Newcastle agreed on a fee of £6.2 million for Chelsea winger. The 25-year-old Ghana international midfielder helped Magpies get promoted back to Premier League. The club sealed an option to make the player’s loan move permanent. Florian Lejeune: Eibar and France defender completed his move to Newcastle by signing a five-year deal. The 26-year-old central defender becomes manager Rafael Benitez second summer signing for a fee understood to be in the region of £8.7million. Stefan O'Connor: Newcastle United agreed on a deal to sign former Arsenal defender on a free. The 20-year-old former England U-17 international was a free agent after the expiration of his contract at Arsenal earlier this summer. Josef Yarney: Newcastle took 19-year-old free agent center back on trial before making the deal permanent. The English defender had been at Everton but allowed his contract to expire before joining United after a successful trial period. Jacob Murphy: Newcastle announced the signing of England Under-21 international winger from Norwich for a fee of £12 million. Javier Manquillo: Newcastle signed former Liverpool and Sunderland defender Javier Manquillo from Atletico Madrid for an undisclosed fee. Manquillo, 23, has put pen to paper on a three-year contract. Mikel Merino: Newcastle has confirmed the signing of Spain Under-21 midfielder on a season-long loan from Borussia Dortmund. Joselu: The Spanish striker completed his move to Newcastle from Stoke.The 27-year-old has signed a three-year deal believed to be in the region of £5million, the Magpies have confirmed. Jan Bednarek: Southampton signed Poland Under-21 defender from Lech Poznan on a five-year deal. The 21-year-old was new manager Mauricio Pellegrino’s first and only addition so far who reportedly cost £5 million. Mario Lemina: Southampton signed midfielder from Juventus on a five-year deal for a club record fee which could rise to £20m. Darren Fletcher: Former West Brom captain and Manchester United player joined Stoke on a free transfer. The 33-year-old experienced midfielder was out of contract at the end of June and agreed on a two-year deal at the bet365 Stadium. Josh Tymon: Stoke signed a highly-rated defender after the teenager turned down a new contract offer at Hull. Stoke confirmed on their official Twitter account that they had signed the 18-year-old left-back on a five-year deal. Kurt Zouma: Stoke signed the 22-year-old center-half on a season-long loan from Chelsea. France international made 71 appearances for the Blues since joining from St Etienne in 2014. Eric Maxim Choupo-Moting: Stoke signed the Cameroon international winger, 28, on a three-year contract at the bet365 Stadium. He joins on a free transfer following his release from Bundesliga outfit Schalke earlier in the summer. Jese Rodriguez: Stoke have announced a season-long loan for the 24-year-old former Real Madrid player, who cost PSG almost £22million last summer. Erwin Mulder: Swansea signed the Dutch goalkeeper on a free transfer. The 28-year-old arrives at the Liberty Stadium having turned down a new contract at Eredivisie club Heerenveen. Mulder signed a three-year deal and became Swansea manager Paul Clement’s first signing of the summer. Tammy Abraham: Swansea signed Chelsea’s England Under-21 striker on a season-long loan. The 19-year-old, who signed a five-year deal with his parent club, spent last season on loan at Bristol City where he scored 26 goals, 23 of them in the Sky Bet Championship. Roque Mesa: Swansea completed the £11 million signing of Spanish midfielder on a four-year deal. Mesa joins from Las Palmas, where he spent seven seasons and helped the Canary Islands club win promotion to LaLiga in 2015. Davinson Sanchez: Tottenham’s long wait for a summer signing ended with the announcement of a move for Ajax 21-year-old Colombian center back on a deal until 2023 for a reported initial £28million fee. Tom Cleverly: Watford announced English midfielder’s loan spell from Everton was made into a permanent transfer. Cleverley signed a five-year deal with the Hornets, moving for a fee of £8 million. Will Hughes: Watford signed the England Under-21 midfielder for a fee of £8 million in a five-year deal at Vicarage Road from Championship side Derby. Daniel Bachmann: Watford secured the services of the goalkeeper after his release from Stoke City. The 22-year-old never played a game for the Potters in his six years at the club but has represented Austria at youth level, including winning 16 caps for the U21 side. Kiko Femenia: Watford signed the right-back from Alaves on a four-year deal. Former Spain youth international, Femenia, now 26 years old, started his career as a winger and has had spells at Barcelona B and Real Madrid B.
Harvey Bradbury: Striker Harvey Bradbury, 19, joined following a successful trial period with the Hornets at the end of last season. The son of former Manchester City forward Lee Bradbury, he had spent the last three years with Portsmouth. Sam Howes: Goalkeeper Sam Howes, 20, joins from West Ham, where he progressed through the Academy and represented England at youth level. Nathaniel Chalobah: The Chelsea midfielder signed a five-year deal at Vicarage Road and has joined for around £5 million. He has returned to Watford after previously spending the 2012-13 season on loan, making 42 appearances and scoring five goals, as the Hornets lost the Sky Bet Championship play-off final. Richarlison: Watford confirmed the signing of Brazilian on a five-year contract. The forward, 20, arrives from Fluminense for £13 million. Jay Rodriguez: West Brom announced the signing of the striker from Southampton for the fee of £12 million. The Baggies have long been linked with the 27-year-old England international. Yuning Zhang: West Brom signed 20-year-old Chinese striker on a three-year-contract from Vitesse Arnhem for an undisclosed fee. The China International has been immediately loaned out to Werder Bremen in the Bundesliga for two years. Ahmed Hegazi: West Brom signed Egypt defender on a season-long loan deal from Egyptian side Al Ahly, where he spent two years after leaving Italian club Fiorentina in 2015. Gareth Barry: The 36-year-old former England midfielder has completed his move from Everton to West Brom on an initial one-year deal for an undisclosed fee. Pablo Zabaleta: The Argentina full-back joined the Hammers on a two-year deal on a free after he was released by Manchester City. Zabaleta made more than 200 appearances for City. The full-back won the Premier League twice as well as the 2011 FA Cup and two League Cups. Joe Hart: Manchester City and England goalkeeper completed a season-long loan move to West Ham. The 30-year-old's preference was to join West Ham after he was told to find a new club. He spent last season on-loan at Torino. Marko Arnautovic: West Ham completed the transfer of 28-year-old forward to move to the London Stadium after Stoke accepted a fee to be in the region of £24 million, a club record. Javier Hernandez: New West Ham striker is delighted to be back in the Premier League after completing a £16 million move from Bayer Leverkusen. The 29-year-old, Mexico’s all-time leading scorer, has signed a three-year deal. Sead Haksabanovic: West Ham signed the Montenegro wonder-kid for £3m from Swedish club Halmstads. Eighteen-year-old attacker previously had trials with Manchester United, Chelsea, Manchester City and Liverpool.